Have you been struggling to get the right job? Are you looking for a job in IT sector, but not getting due to stiff competition and low supply of jobs? This is the right time to act for you as with the recent implementation of the GST regime in the Indian taxation system, over 1 lakh jobs in taxation, accounting, and data analysis is predicted by major sources. It is the best news Indian job industry has heard in many years and candidates should take this opportunity seriously as it would help them forge a promising career for themselves. Since 1991 economic reform, the GST reform is the most beneficial decision made by the government for the Indian economy. It would help both businesses and individuals to enhance their revenue. Almost every job sector in the country that includes accountancy, taxation, lawyers, banking, finance, insurance, medicals, food processing, semi-skilled workers, eCommerce, automotive, media, etc will see a remarkable increase in the employment opportunities, suggests report. This is due to the fact that GST will fuel the demand for professionals in all these industries which needs to be met as soon as possible, otherwise, the industry will suffer a great loss. To overcome this gigantic loss, many companies, both small and large sized, are or will soon begin hiring candidates. They will hire the candidate they see fit for the role and you could be one if you have the talent, skills, and knowledge needed. According to the reports, an estimated increase of over 1.3 million jobs can be witnessed in the next two years, with some 1 lakh jobs only be expected in taxation, accounting, and data analysis. With GST regime, the distribution of goods and services would be easier and faster, and the data recorded would require being processed quickly and accurately. Surely business organizations would need accountants with taxation knowledge, especially GST, to speed up the process along with data analysts who could predict the number of sales generated and cash flow. In a recent interview by Rituparna Chakraborty, the President of Indian Staffing Federation, GST will make the cash flow more profitable and predictable due to faster distribution of goods and services. She further added that the transparency of compliance would also push the country to greater formalization. This would show an increase of at least 10-13% growth in a job in the field of taxation and accountancy. The demand for outsourcing and consultancy firms will also increase as small and medium-sized industries would hire these third-party firms to fasten up their tax processing. Thus, if you are studying accountancy and taxation or data analysis and willing to ensure that you get appointed as one in a reputed business firm, then it is highly recommended that you first enhance your knowledge and skills in the area so that, the recruiter can hire you for the job profile amidst stiff competition. To make it happen, you will need to attend a high-quality training course in your respected field and acquire certification. 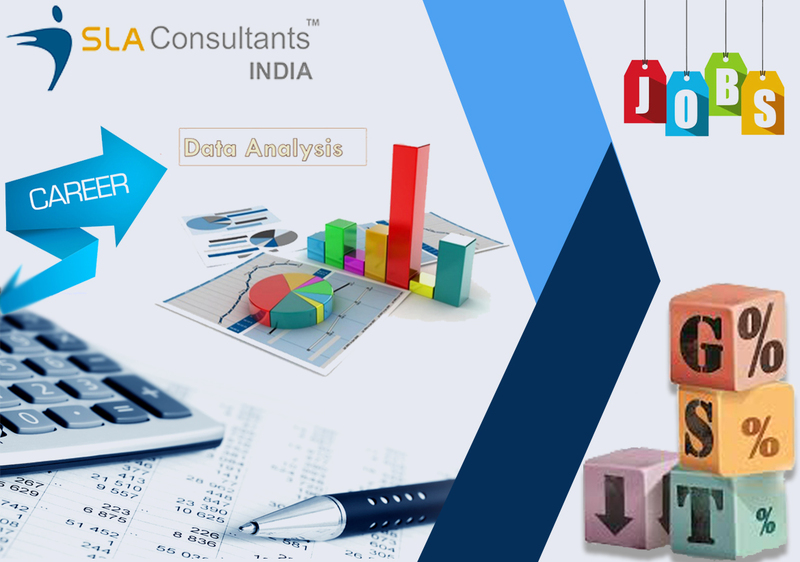 SLA Consultants India is a renowned and well-recognized training institute located in Delhi NCR with a vision to offer the best accountancy and taxation training to aspiring candidates. We provide the students with rigorous training in data analysis as well so that the learner understands all the concepts of business process and perform their duties with confidence and efficiency. We also comprise with the most qualified and trained instructors who offer the best comprehension using the latest technology. The training courses also include intense concepts of GST to make sure the candidate employ them in their respected field fluently. To know more about these training courses or our Institute please visit our official website.